Apple has begun to send out invitations for a special media event on Wednesday, March 7 at 10am PST. The event will take place at the Yerba Buena Center for the Arts in San Francisco, where both the original iPad and iPad 2 were announced in 2010 and 2011, respectively. The company did not specify what this year’s event will be about, but given the invitation pictured above, it’s a near given that Apple will unveil the next-generation iPad. The date comes as no surprise—rumors have been swirling for some time now that Apple planned for the first week of March for an iPad 3 announcement. As for what to expect, the rumor mill has been all over the map, pointing to upgraded cameras, a possible quad-core processor, 4G/LTE support, and of course, a high-resolution “retina” class display like that of the iPhone 4 and 4S. With the event officially one week and one day out, Apple-watchers now have eight days to speculate. 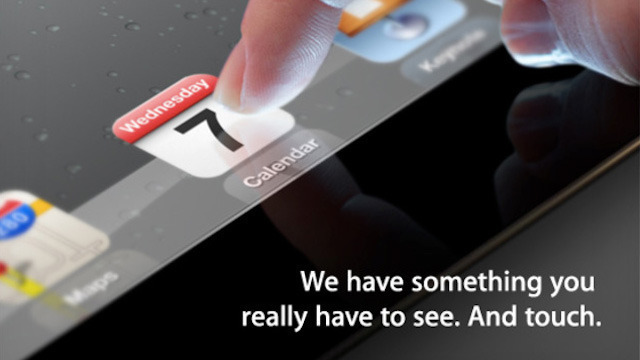 What are you hoping to see on March 7 from Apple? As always, you’ll be able to follow our coverage of the announcements here on Infinite Loop, so be sure to check back when March 7 rolls around.